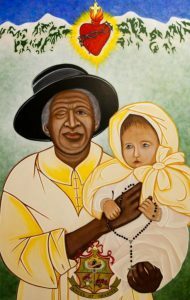 DENVER (CNS) — Denver Archbishop Samuel J. Aquila Dec. 18 formally opened the sainthood cause of Julia Greeley, a former slave who spent her days caring for the poor, during a Mass at the Cathedral Basilica of the Immaculate Conception in downtown Denver. Born into slavery in Missouri in the 1840s, Julia Greeley gained her freedom after the Civil War and worked as a nanny. She moved to Denver, where she was employed to care for the children of William Gilpin, the first territorial governor of Colorado. Known for her love of children and the poor, Greeley also was a known for her piety, often passing out prayer card devotions to the Sacred Heart. She was a convert to Catholicism. In November, Archbishop Aquila presented the case for Greeley’s potential sainthood at the annual fall general assembly of the U.S. bishops in Baltimore. As part of the episcopal consultation in the Catholic Church’s process for causes, the bishops Nov. 15 approved by voice vote that her sainthood cause should go forward. At a conference in Rome in September sponsored by the Denver Archdiocese and the Pontifical Commission for Latin America, Greeley was recognized in a group of evangelizers and missionaries in the church in the Americas that included Jesuit Father Eusebio Kino, who served in the U.S. Southwest, and Franciscan Father Antonio Margil de Jesus, a missionary who evangelized North and Central America. Greeley’s ministry to the poor on the streets of Denver and her piety is all “evidence of a beautiful life . . . of a saintly life,” said Martha Reichert, who is president of Endow, an apostolate dedicated to educating Catholic women and girls. Reichert said Greeley’s life shared “a striking connection” with the Year of Mercy because it was an example of the “enduring power of mercy.” Despite her sufferings at the hands of white people, Greeley held no grudge, Reichert said, and she went out of her way to help all poor people, no matter what their race. The Julia Greeley Guild, headed by Mary Leisring, has been working to spread awareness of Greeley since 2011. As the director of black Catholic ministry for the Denver Archdiocese, Leisring said she is thrilled at the possibility of Greeley’s canonization.